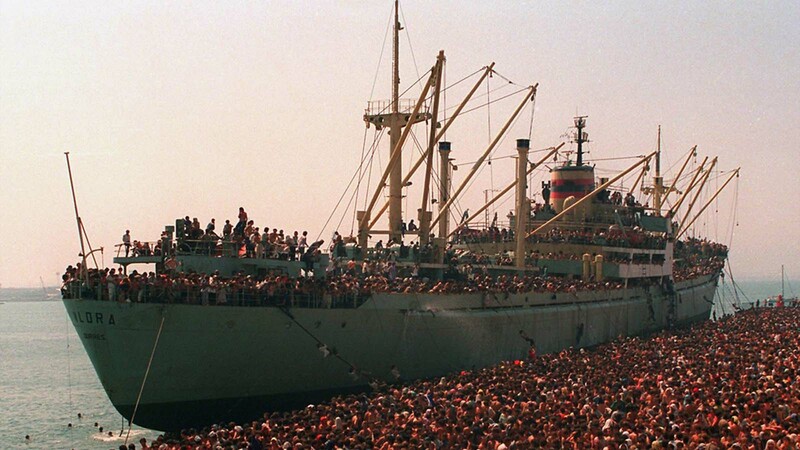 Refugees from the cargo ship Vlora in Bari’s port (Italy) on 8 August 1991. The fall of communism in Albania taking place in the early 1990s gave way to a major economic collapse (with severe food shortages) amid widespread political and social unrest in the country. This incited many Albanians to try to leave the previously secluded nation. People felt overwhelmed by hopelessness and although their knowledge of other countries was based solely on what they had heard, or seen on Italian television, they long for the opportunity to start a new life abroad. A good part of emigrants aimed for Italy, less than a hundred miles away from Albanian ports across the Strait of Otranto, partly attracted to the (erroneous) portrayals of wealth on Italian television adverts they were able to watch in Albania. The cargo ship Vlora (pictured above) had returned from Cuba with a load of sugar, its main motor was out of use and it docked in Durrës to unload its cargo and go through repairs. Meanwhile, throngs of people had gathered in the port from around the country in the hope of boarding any ship and sail to Italy. 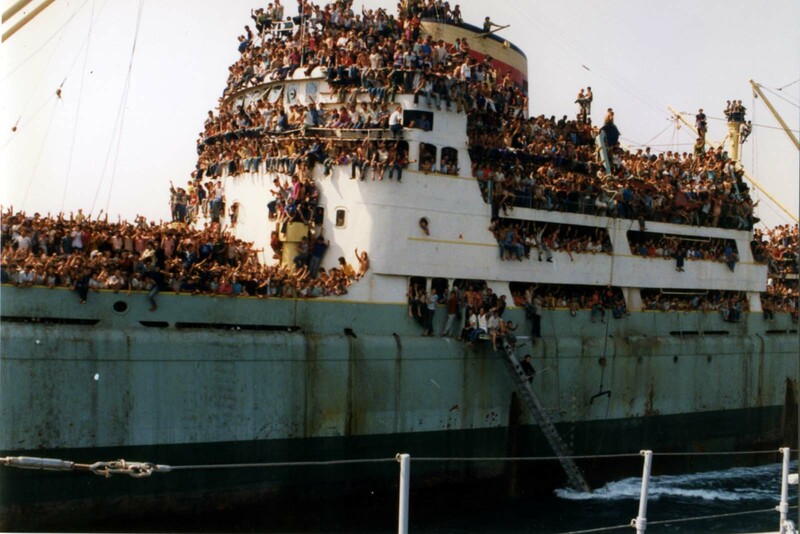 Without anyone to stop them, thousands of them (between 10,000 and over 20,000 according to reports) boarded the Vlora on 7 August 1991 by jumping in the sea and climbing aboard on ropes, filling virtually every inch of the ship (some hanging from ladders for most of the voyage). Unable to talk the stowaways – some of whom were armed – out of their plan, the captain, Halim Milaqi, decided to sail the overcrowded boat for Italy, fearful of what could happen if amateurs were to commandeer the ship. Sailing with only its auxiliary motors, without a radar (due to passenger presence) and with excess weight, the ship also lost its cooling tubes after passengers cut them open to try to hydrate themselves, with the captain then using seawater to avoid melting the motor. They fortunately benefited from generous weather and arrived on Italian shores in the early hours of 8 August. Approaching Brindisi’s port at around 4AM, the captain was advised against docking in the city hence the captain changed course to Bari, only 55 miles ways, which the weakened ship took 7 hours to reach. Virtually every inch of the ship was filled (some hanging from ladders for most of the voyage). An attempt was made to blockade the port’s entrance using small ships to try to constrain the captain to return to Albania. 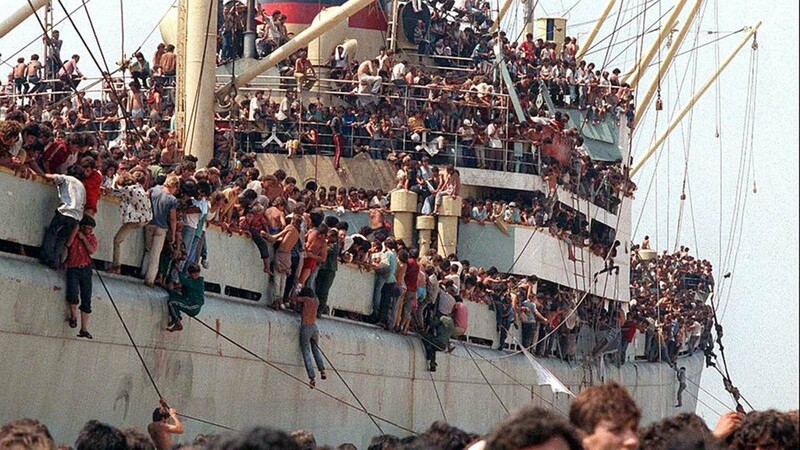 Citing the worsening conditions on board the ship, after passengers had spent 36 hours with virtually no food or water in stifling heat, captain Milaqi refused to back down and entered the port, communicating that he had injured people aboard and he could not mechanically turn around. Finally the Vlora was made to dock at the quay furthest away from the city center usually reserved for coal unloading. 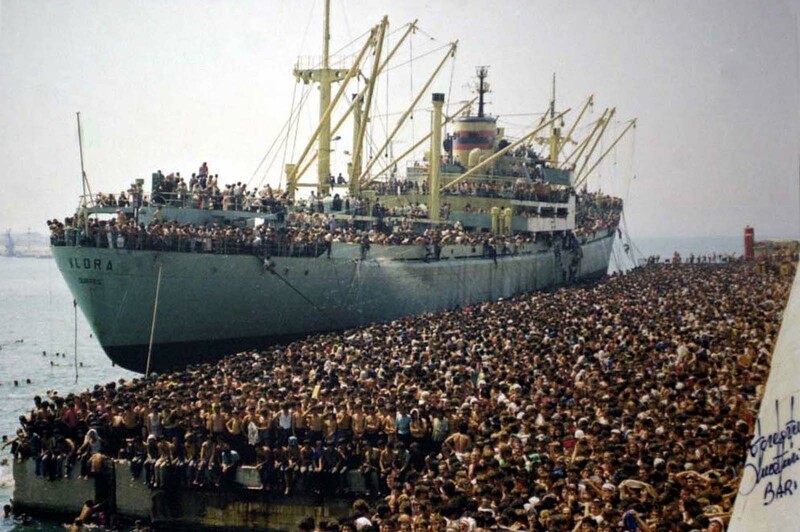 The Italian government’s hard-line policy was to stop refugee ships from landing on Italian shores and otherwise deporting immigrants straight away. 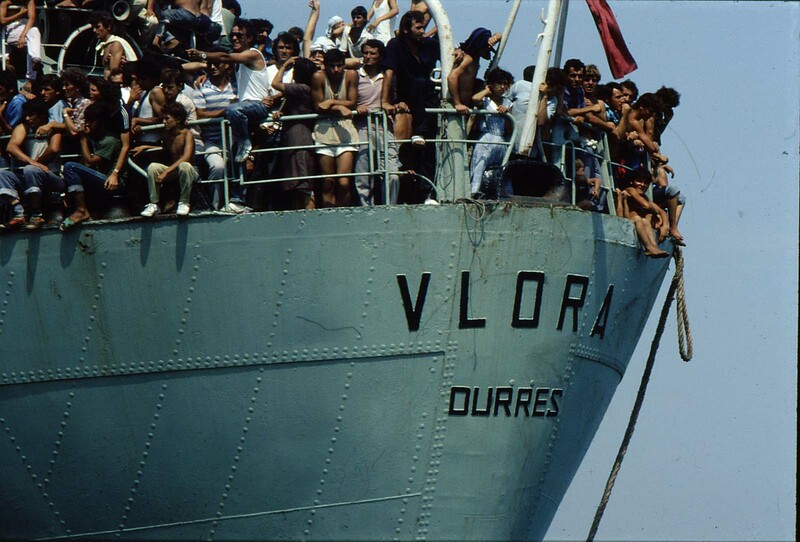 As such, the Vlora’s passengers did not disembark to a warm welcome, orders from Rome called for them to be kept in the port, with little to no material help, and ferried back to Albania within days if not hours. The authorities started bussing the immigrants from around midday to the Stadio della Vittoria , an out of use stadium, where they would be kept until their deportation. By the afternoon the Albanians had understood that they were ultimately to be sent home, groups of them tried to force their way through the police cordon surrounding the stadium, with many managing to escape, the authorities then decided to stop bringing anyone to the stadium and close the gates, locking them inside. The night saw the tension flare up even more, with clashes between the police and Albanians trying (and succeeding for some) to break through the cordon. However on the next days around 3,000 had been repatriated, some left voluntarily as the hostile reception and poor conditions had left them disillusioned about life in Italy, most were told lies, with the ships and planes supposed to take them to other Italian cities. 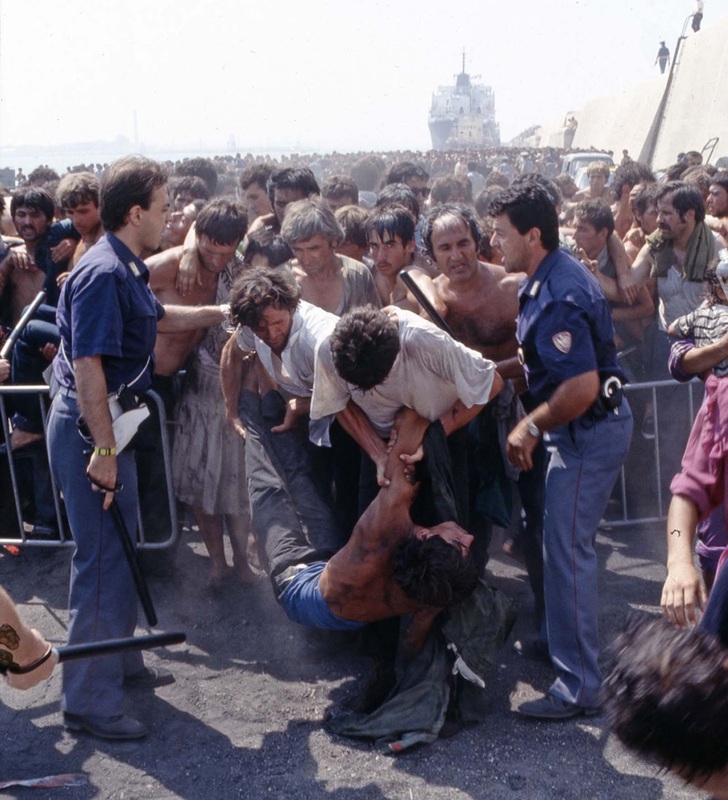 Their harsh treatment was criticized by human rights organizations and the Pope, but was justified by the Italian government as necessary to deter further irregular migration from Albania. Albania’s forty years of communist isolation from the rest of the world, combined with its disastrous economic, social and political situation, had a traumatic effect on its citizens. After several hours of waiting in the port of Bari, the Italian authorities allowed the Albanians to disembark for humanitarian reasons. 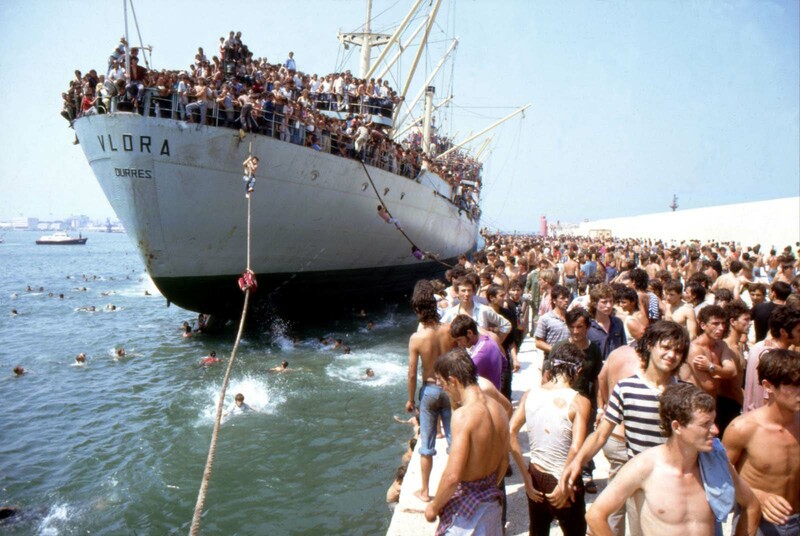 The Vlora was made to dock at the quay furthest away from the city center usually reserved for coal unloading, whilst in the port scores of its passengers jumped into the water and swam to the shore or climbed down ropes while it was mooring. Although there was remarkable sympathy for the Albanians in Italy, the official Italian position was that these persons were seeking economic betterment in Italy and consequently could not be considered as political refugees. The vast majority of the Albanians, according to their accounts of the exodus, fled their country because they felt “buried alive” there.